The hour is at hand! 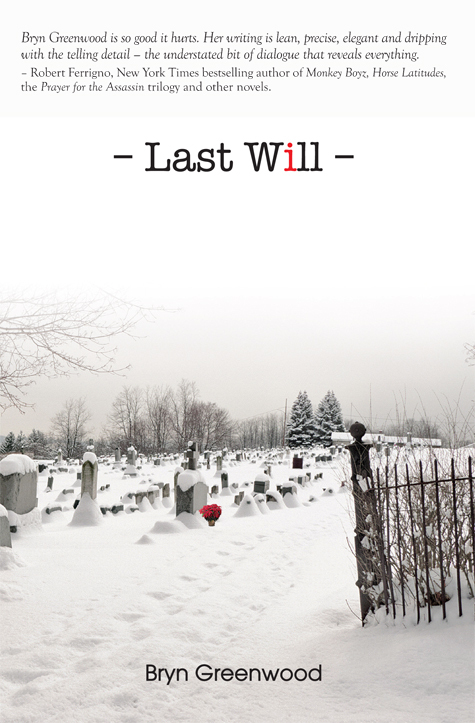 Well, here’s the official day … Last Will is out in the wild. 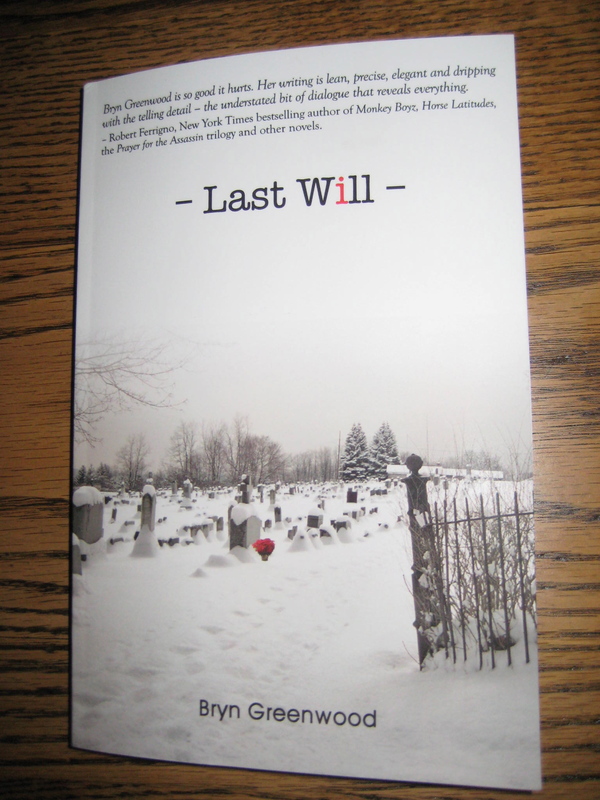 Amazon, Barnes & Noble, direct from the publisher, Stairway Press. I’m feeling a little excited and slightly anxious. After all, the first inevitable bad review must come. I’ll feel better when it’s over. So far the nicest thing is how supportive and helpful people have been. I’ve discussed this with other folks, but I’ll say it again: with very few exceptions, book people are good people. Now that I finally have a book coming out, they’ve been on this see-saw of excitement and dread. My mother, holding the book in her hand and frowning: I’m not going to be shocked, am I? Well, you’ve know me for forty years. If I can still shock you, I’ll be pleased, but I kinda doubt it. My sister, calling me immediately after she finished reading: OMG!!! I really really liked it! I was worried that I wouldn’t, because … you know, but I really do! Because … I’m a weirdo? Who writes weird things? Or because you weren’t sure I was any good at it? My cousin: I’m not in there, am I? Only if you’re an alcoholic alien abductee or a beauty queen or an elderly rich woman. Are you? In summation: the book isn’t all that weird, I think it’s competently written, and I didn’t base the characters off my family. Alas, the book is out, but I’m not yet a millionaire, so I better quit futzing around here and get back to work. Cheers! And I hope you enjoy it. 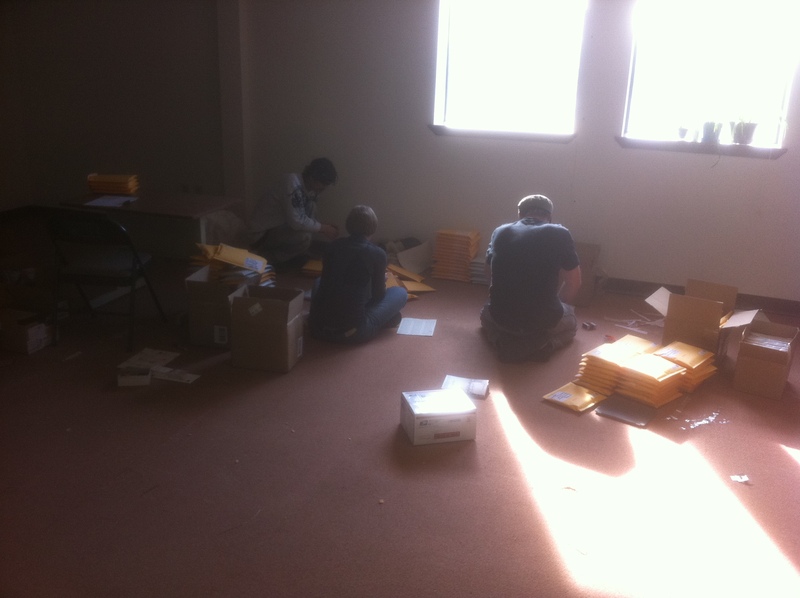 PS: the contest winners’ books are going in the mail today! I’m pretty sure there’s some magical way for me to pull all your email addresses from my contest platform, so I plan to send out an email to check on your mailing addresses. If you don’t hear from me by tomorrow, though, would you shoot me a message? Now I must scurry back to Real Job™!! 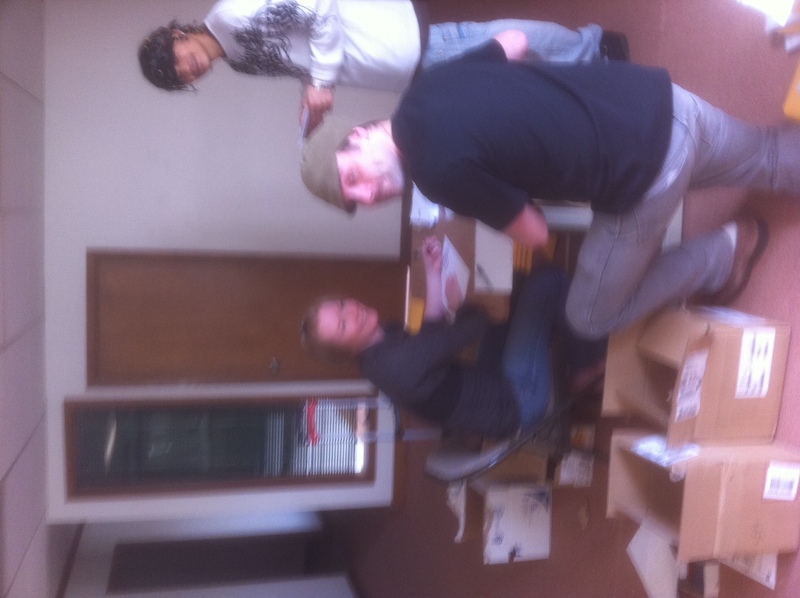 My publisher, Ken at Stairway Press, sent me pictures of the folks who are working today to put together book packages. The book, plus a press release, is going out the door to reviewers. 130 copies in all are going. Check it out! That's a lot of books! Now that I have this pile of advanced reader copies taking up space on my dining room table, I need to start giving them away. The cats said I had to, as they’re not willing to share the table with my books. So, here’s the deal. I’m giving away the twelve (12!) 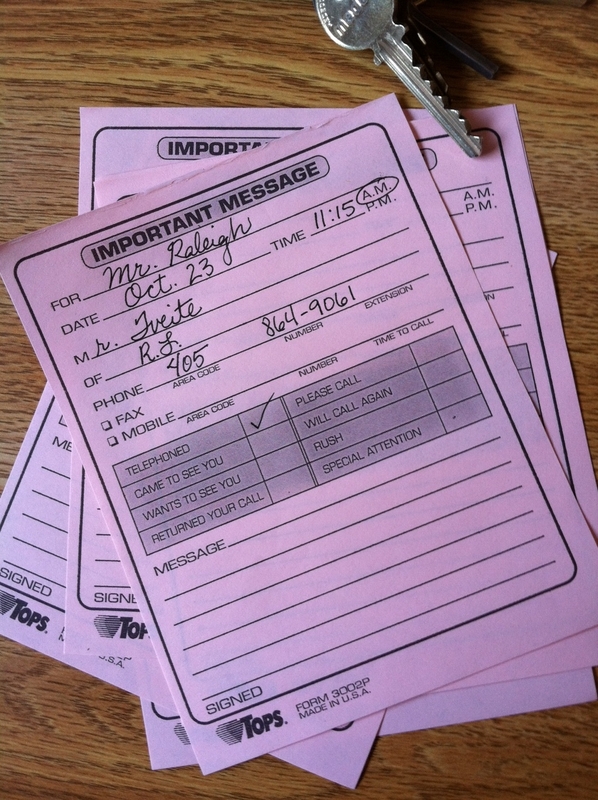 copies of the book seen in the following picture. That includes the top copy where I scattered cat treats to lure the cats into posing. It may smell a bit fishy, but it’s a free book! 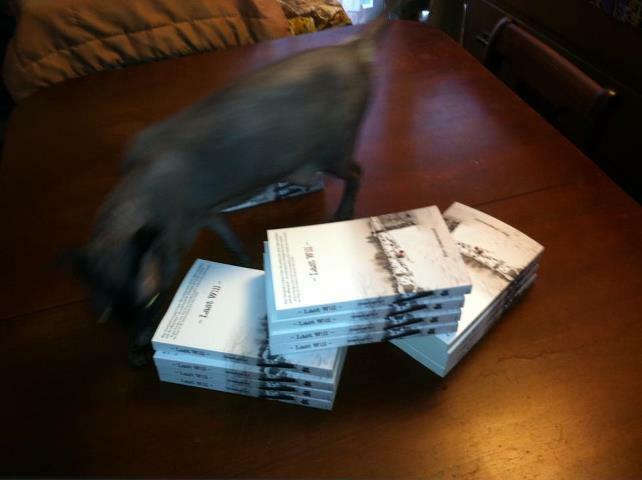 I’ll be happy to autograph the twelve copies in any way the winners see fit. 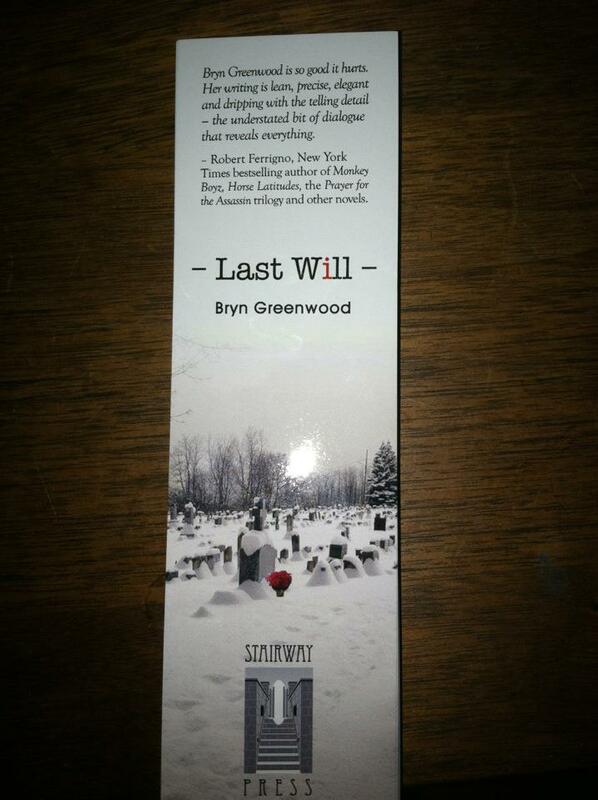 Additionally, I’m giving away 20 bookmarks as secondary prizes. However, if you’d like to enter the giveaway multiple times, come visit me over on Facebook. There you can see the full array of things that will get you more chances to win. You can Like my author page on FB, follow my blog, follow me on Twitter, retweet the giveaway, and you can add the book to your to-read list on Goodreads. The contest o-fficially begins at midnight tonight and runs for a full week. Bernie Raleigh fails at everything he touches. The victim of a kidnapping for ransom as a child, Bernie has spent his adult life trying to avoid being noticed. That’s impossible once he inherits his grandfather’s enormous fortune. The inheritance comes complete with a lot of obligations, a mansion, and a problematic housekeeper named Meda Amos. Beauty queen, alien abductee, crypto-Jew, single mother — Meda is all those things, and she may also be the only person who can help Bernie survive his new and very public life. I suppose it’s official now: my book really is being published. And I have a photo of a book fort with a cat to prove it. As many people before me have ascertained, it’s just not real until you have enough copies of your book to build a pyramid. Stay tuned. I’ll have details on how you can win a copy soon.